Refilling ink cartridges was how Men In Ink started. It was a new concept way back then and it took off wildly! Pretty much everything could be refilled, and with a little expertise we kept our customers printing and saved them bucket loads of cash. Fast forward to 2017 and it's a bit of a different story. We still refill everything we possibly can (and you'll still save money!) but the industry has changed quite a bit. Here are the most frequently asked questions, answered. Can all ink cartridges be refilled? No, unfortunately not. Printer manufacturers use things like computer chip technology and constant software updates to make it very difficult to refill their cartridges. We are still able to refill many cartridges, but some refills are sadly just not possible. As well, rare or unique printers/technology (like Epson's chromium ink) aren't usually refillable. My cartridges have been out of my printer for a while. Can they be refilled? Maybe?! Cartridges with a print head will usually dry out within 2-3 weeks when out of your printer (or even in your printer). If you can’t get to us right away, store your freshly empty cartridges with a damp paper towel in a sealed plastic bag. This will prevent them from drying out for a longer time frame! Cartridges without print heads (ink tank style) can usually be refilled even if they’ve been empty a while. Bottom line, fresh is best! What type of cartridge works best for refilling? Ink tank style is best! They have a longer life span and are less troublesome. How many times can I refill my cartridge? We will advise you when it’s time to replace your cartridge, but here are some general guidelines: Canon print head style cartridges refill a maximum of two times, while HP print head style can be refilled up to five times. All ink tank style cartridges can usually be refilled almost indefinitely but the sponges and working components will wear out eventually. All refilling estimates depend on how you care for your cartridge and how quickly you bring it in when it's empty. Can my ink cartridges be swapped for pre-filled cartridges? Yes! We do this for pretty much all ink-tank style cartridges. You bring us your empties and we swap them for already filled cartridges we have in stock for the price of a refill. It's instant gratification at it's finest! No swaps are available for print head style cartridges. Do you test my cartridge when you refill it? Yes, we print test most print head style cartridges during the refill process. Even if we don't have a way to print test your particular cartridge, we will do everything we can to make sure it works. And all refills we do are backed by our 30-day guarantee. Also note that all ink tank style cartridges don't need to be print tested! Will refilled ink colours be the same as the original? Our inks are laboratory matched as closely as possible to the original ink in your cartridge. They might not be exact for certain specific printing needs (ie: professional photo printing) but are very close, if not exact, for most applications. Feel free to get in touch with us for more specific questions about your cartridge or printing needs. How many pages will I get out of a refilled cartridge? Unfortunately, this is an impossible question! Every printer and cartridge is different, and things like print quality, type of paper used and frequency of printing will affect how many pages you can expect from your cartridge, whether new or refilled. What we can tell you is that we will put as much ink as possible into your cartridge when we do a refill. You should expect a similar page count to what your cartridge printed originally. How long does it take to refill my cartridge? 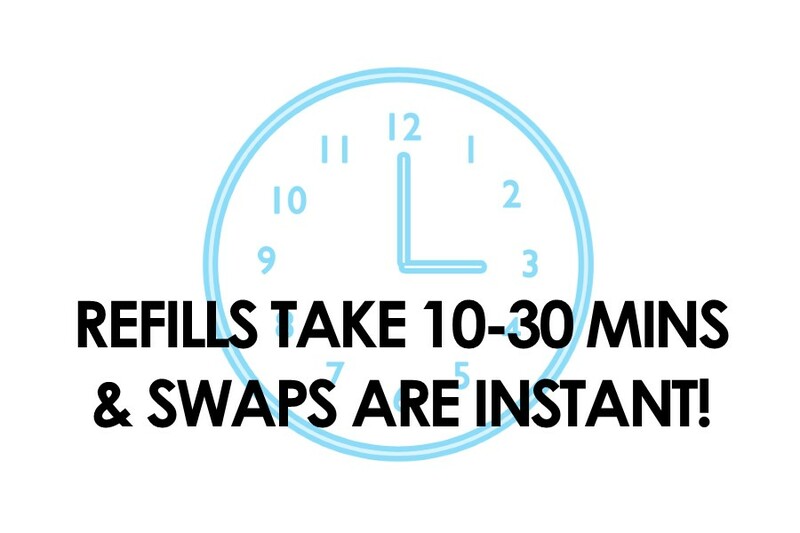 We strive to get your refills done while you shop, typically in half an hour or less. Times will vary depending on how busy we are since we work on a first come, first served basis. We will make every effort to meet your needs, whatever they are! If you’re in the mall after-hours, be sure to make use of our drop off service. Simply fill out the form, leave your cartridges, and we'll have them ready for you when you return! How do I transport my cartridges to you for refilling? Place them in a sealed plastic bag or container when you bring them to us for refilling or recycling. Even empty ink cartridges contain some ink and can leak! Be careful when storing/transporting them and keep them away from all clothing and valuables. We hope that helped answer some questions you had, or didn't even think to ask, about ink refills. We're always around to answer further questions and give sound printing advice, so feel free to get in touch. Please share or comment if this helped you or might help someone else you know. Stay tuned for part two coming soon!